Natural history stretches as far as you can see in the Porcupine Mountains, from the vastness of Lake Superior to the verdant expanses of one of the largest concentrations of old-growth forest in the Midwest. 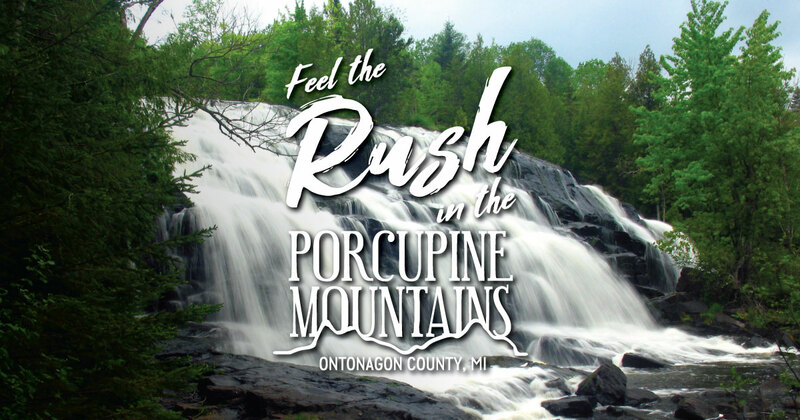 But, if you look a little closer, you can find evidence of some man-made history: Abandoned copper mines dot the landscape of the Porcupine Mountains. Two of these former mine sites are easily accessed by visitors to the Porcupine Mountains Wilderness State Park. Take a short stroll 100 feet into the now-sealed entrance of Mead Mine, a roadside stop on M-107 between the ski hill and Lake of the Clouds. Take South Boundary Road to the southeastern corner of the park, and you’ll find the ruins of Nonesuch Mine (as well as Nonesuch Falls), which operated sporadically from 1867 to 1912. Copper mining was long the lifeblood of the Upper Peninsula. Adventure Mine, located in Greenland Township, allows visitors to explore one of the best-preserved copper mines in Michigan. Visitors can choose from four underground tours, from basic walking tours to a more daring tour that requires participants to rappel to the second level of the mine. Mountain bikers and hikers can also take advantage of 4 miles of trails around the mine site. There’s even an annual mountain bike race—the Miner’s Revenge—that passes through the mine. Find a hands-on experience at Caledonia Copper Mine in nearby Mass City, a short drive from Ontonagon. The mine originally started operation in the 1860s but now welcomes groups—admission is free, but reservations are required—to dig through private ore piles to uncover rocks and minerals. Safety glasses are required (bring your own or buy on site), and gloves are recommended.